Portia Zvavahera was born in 1985 in Juru, Zimbabwe, and lives in Harare. 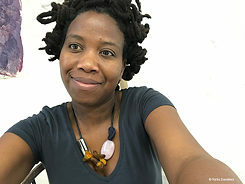 She studied at the BAT Visual Arts Studio under the auspices of the National Gallery of Zimbabwe between 2003 and 2005, after which she obtained a Diploma in Visual Arts from Harare Polytechnic in 2006. © Portia Zvavahera She has had five solo exhibitions at Stevenson Cape Town and Johannesburg (2014-17), and one at Marc Foxx Gallery, Los Angeles (2017). She held a solo exhibition, Under My Skin, at the National Gallery of Zimbabwe, Harare, in 2010 and has taken part in numerous group exhibitions in that country. She represented Zimbabwe at the 55th Venice Biennale in 2013 as part of the exhibition Dudziro: Interrogating the Visions of Religious Beliefs at the Zimbabwean Pavilion. Zvavahera has been included in the group exhibitions Body Luggage, part of the steirischer herbst festival in Graz, Austria (2016); I Love You Sugar Kane at the Institute of Contemporary Art Indian Ocean, Mauritius (2016); African Odysseys at Le Brass Cultural Centre of Forest, Belgium (2015); Liberated Subjects: Present Tense at Foundation De 11 Lijnen in Oudenburg, Belgium (2015); and Shifting Africa - What the Future Holds at the Mediations Biennale,in Poland and Kunsthalle Faust in Hannover (2014). She has recently completed a residency at Gasworks, London and was artist-in-residence at Greatmore Studios, Cape Town, in 2009. In 2013 she was the recipient of the 10th Tollman Award for the Visual Arts, and in 2014 won the FNB Art Prize, awarded at the Joburg Art Fair.